The problem with too many negotiations is that they shouldn’t even be happening! 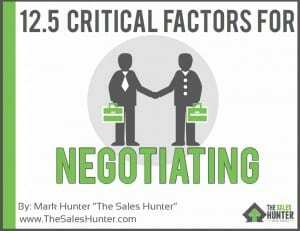 There are critical factors for negotiating and too many salespeople either don’t know them or continually overlook them. In Mark Hunter’s free eBook, you will learn the 12.5 critical factors to ensure you will be successful in your negotiations. Most importantly, you will learn that negotiation does not have to be your automatic strategy to close more sales.